Virtual Trade Shows and Webcasts have become the single most important marketing tool to generate leads and drive new business. Following just a few best practices can make the difference between a huge success and a waste of time and resources​​. Comparing your virtual event performance against a set standard is key to see just how well you are measuring up. Communique Conferencing just recently published its 2016 Virtual Trade Show & Webcast Benchmark Report highlighting trends relevant to attendance and attendee engagement to help with future virtual event planning for our customers. Want to learn more? 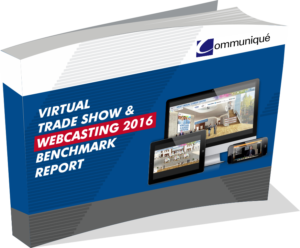 Download the free Communique Virtual Trade Show 2016 Benchmark Research Report.